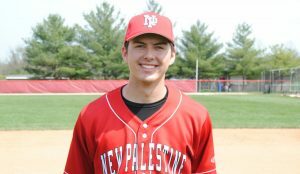 In a matchup of conference champions to open the sectional, the New Palestine baseball team used a big start and an even bigger pitching performance to beat Lawrence Central 8-1 Wednesday. The Dragons (21-6) advance to meet Lawrence North at 5:30 p.m. Thursday in the sectional semifinal at Warren Central. Jacob Garrison took a no-hitter into the sixth inning. He allowed one run and two hits in six innings, striking out 14. Cameron Pitzer pitched a perfect seventh to nail down the victory. Offensively, the Dragons jumped ahead with two runs in the second inning. Jacob Bain led off with a single, followed by a walk issued to Luke Greene. Myles Kost legged out an infield hit to plate Bain, and Greene came home on an error. Pitzer hit a two-out RBI single and Greene followed with a two-run double in the third to extend the lead to 5-0. Three LC errors and Colby Jenkins’ RBI single plated two more runs in the fourth, giving the Dragons a 7-0 edge. The eighth run came home in the sixth when Jenkins led off with a single and scored on Pitzer’s infield hit. Jenkins had three of the Dragons’ 10 hits, scoring twice and driving in a run. Pitzer and Bain also had two hits each. Pitzer drove in two runs and Bain scored twice. Garrison, Kost and Greene also had hits. Jacob Garrison took a no-hitter into the sixth inning and struck out 14 in the Dragons’ first-game sectional victory.